This blog contains about the tourist attractions around the world, travel tips, travel packages, hotel information, family travel destination, etc. Assorted pastas like fusilli, spaghetti, penne and generally served with extra tomato sauce to be more delicious. Not only tomato sauce, bolognese or carbonara sauce could also be an option. Although there are dozens of types of pasta sauces for a variety of alloys. Presumably some of this sauce really liked the people in Italy and in the world. Carbonara is a suitable choice of sauce served with any type of pasta. 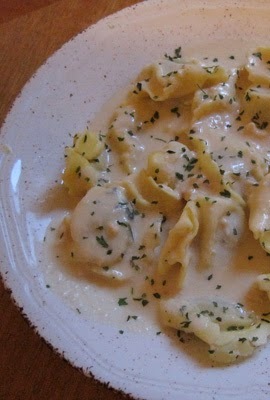 This creamy sauce made ​​from olive oil, processed meat, garlic, egg, cream, and parmesan cheese. Because it is made from eggs and cheese, carbonara sauce per serving in fat and sodium is quite high, around 32 grams and 1500 mg. Sauce originating from Bologna , Italy is known as ragu'alla bolognese . Bolognese generally ' paired' with spaghetti, fettucini, and pappardelle. Red sauce is made from tomato puree, olive oil, onion, celery, carrots, and additional ground beef. Bolognese sauce also added a few pieces of bacon, red wine, and beef broth. When most of the pasta sauce given extra meat, sauce primavera further highlight the use of vegetables, such as broccoli, carrots, peas, and tomatoes. Primavera also given additional herbs and parmesan cheese. Generally primavera sauce served with small pasta, such as penne. When presented with fettucini primavera sauce, vegetables are usually thinly sliced ​​lengthwise to adjust the length of pasta. Pesto sauce originated in Genoa, which is a region in northern Italy. The green sauce made ​​from fresh basil, parmesan cheese, garlic, pine nuts, and olive oil . Generally served with pesto penne, fusilli or spaghetti. Pesto sauce per serving is 49 grams of fat and sodium as much as 483 grams. Marinara sauce comes from the southern region of Italy. Red sauce is made from tomatoes, basil, garlic, herbs, oregano, and onions. The usual type of pasta served with marinara sauce is spaghetti and fusilli. In addition to pasta, marinara sauce is also served with rice suitable or pizza.